This stunning, hilarious and action-packed graphic novel re-imagines Rapunzel's story . . . in the wild west! Rapunzel escapes her tower-prison all on her own, only to discover a world beyond what she'd ever known before. 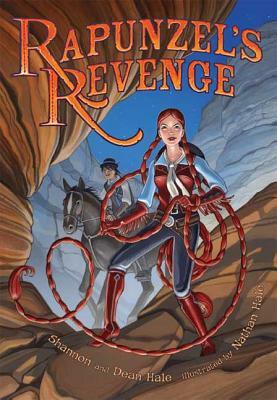 Determined to rescue her real mother and to seek revenge on her kidnapper would-be mother, Rapunzel and her very long braids team up with Jack (of Giant killing fame) and together they preform daring deeds and rescues all over the western landscape, eventually winning the justice they so well deserve. Nathan Hale is the author and illustrator of the picture book The Devil You Know, and the illustrator of The Dinosaur’s Night Before Christmas, Animal House, and Balloon on the Moon. He has also illustrated two graphic novels, Rapunzel’s Revenge and Calamity Jack by Shannon and Dean Hale.